Bringing together a core group of UC and Cal State faculty working at the intersections of feminist studies and ethnic studies, we will generate a curricular vision that, rather than being negatively constructed as a critique (of patriarchy, mainstream feminism, “wave”-based periodizations, etc.) begins with concepts like race, empire, and settler colonialism. Conversely, we imagine ethnic studies as foundationally organized around gender and sexuality, centered on concepts such as reproduction and sexual violence. While critiques of Women and Gender Studies and Ethnic Studies as disciplinary formations have long existed, we hope that by generating shared curricular materials, we can further engage the intellectual repercussions of (inter)disciplinarity and strategize ways to make institutional interventions. We aim to collectively generate the kind of work called for by such critiques, and to share strategies for the careful institutionalization of such work. This event is intended to support current efforts to establish a Critical Race and Ethnic Studies (CRES) program at UC Santa Cruz, in addition to enabling a conversation amongst group participants. While student efforts at establishing ethnic studies as a major have a long history at UCSC, it was not until the disestablishment of American Studies, which led to massive student protests against the lack of institutional support for the study of race and ethnicity in 2011-12, that these efforts received administrative attention. In 2012-13, a working group consisting of faculty, undergraduates, and graduate students has met regularly around a series of talks and workshops aimed at developing a CRES major. The major was approved in Spring 2012, with courses scheduled to begin 2012-13. 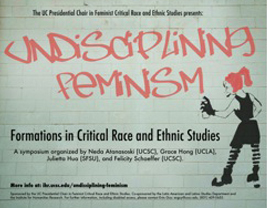 The public portion of our event, sponsored by Bettina Aptheker and Karen Tei Yamashita’s Presidential Chair in Feminist Critical Race and Ethnic Studies, is intended to be in conversation with and to raise the profile of CRES, as well as the launch of the Feminist Studies graduate program. Where, why and to what effect does the complicity of feminisms with the security state, the carceral turn, settler colonial states, and so forth take place? What are some alternative genealogies of feminism (perhaps not recognizable or identified as such) that we might consider as generative for thinking about difference? Why might they not be as legible as points of departure for feminism? What are the political possibilities and perils of visibility and legibility?